In this section I wish to show how the XOR operation (the exclusive “or”) can be performed by a dynamical system which has a close formal resemblance to a liquid forming hexagons in a nonequilibrium state. This will allow us to construct a synergetic computer for this operation. Historically, the XOR operation has played an important role in the discussion of parallel computers, or in other words, connectionist machines or neurocomputers. Following up the basic concepts of McCulloch and Pitts, Rosenblatt (1958) had developed his perceptron. 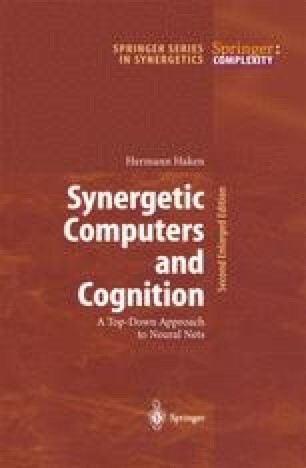 The continuation of this work was “killed” (to use Sejmour Papert’s words) by the influential book by Minsky and Papert (1961), “Perceptrons”. In that book they showed that Rosenblatt’s perceptron cannot perform the XOR operation. Nowadays, the XOR operation can be performed by neurocomputers with several layers and a sigmoid activation curve (instead of the original steep threshold curve of McCulloch and Pitts).